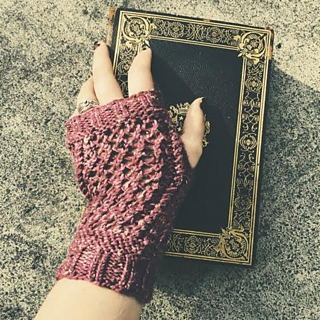 These fingerless mitts have a quasi-Victorian charm that was inspired by the Steampunk Age of Brass and Steam era. 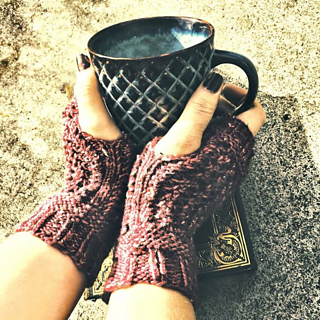 The design is easy and quick, but the combination of lace mesh, twisted stitches and ribbing give it a stylish look and the “No Thumb” thumb opening makes them a breeze to knit. They are worked from the cuff up and are knit in the round until you get to the thumb opening. Twisted stitches run up both sides and the hand incorporates lace mesh, garter bands and twisted ribbing. 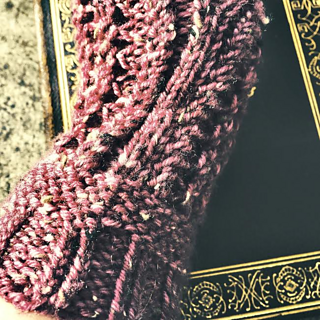 The pattern is written as a one size fits most but you could easily customize them by adjusting the length. 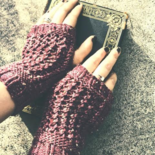 Other accessories could also be added to the cuff for a fun Steampunk look.